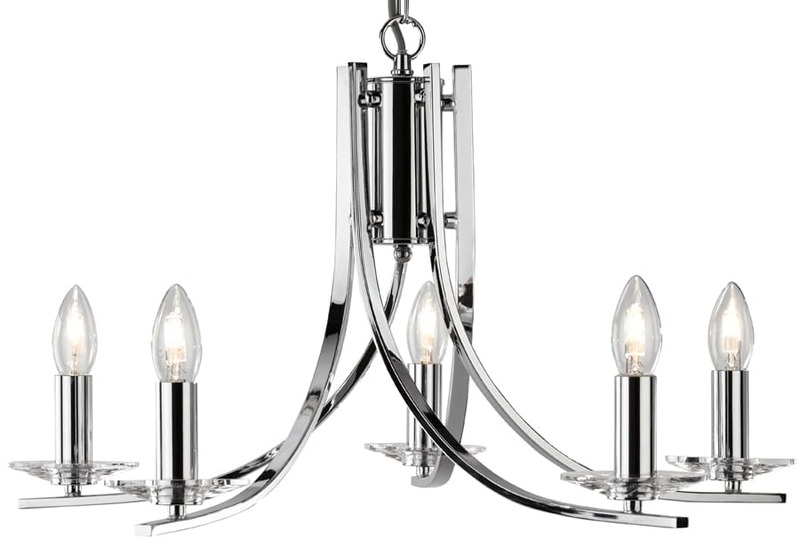 This Acsona modern polished chrome 5 light twist chandelier with glass sconces features a sweeping design, with flat bar arms and candle style lights. A medium sized chandelier, with ceiling cup, chain link suspension and cylinder central column. Five swooping flat bar arms attached to the body and twist through one another, with cut glass sconces and matching candle tubes. 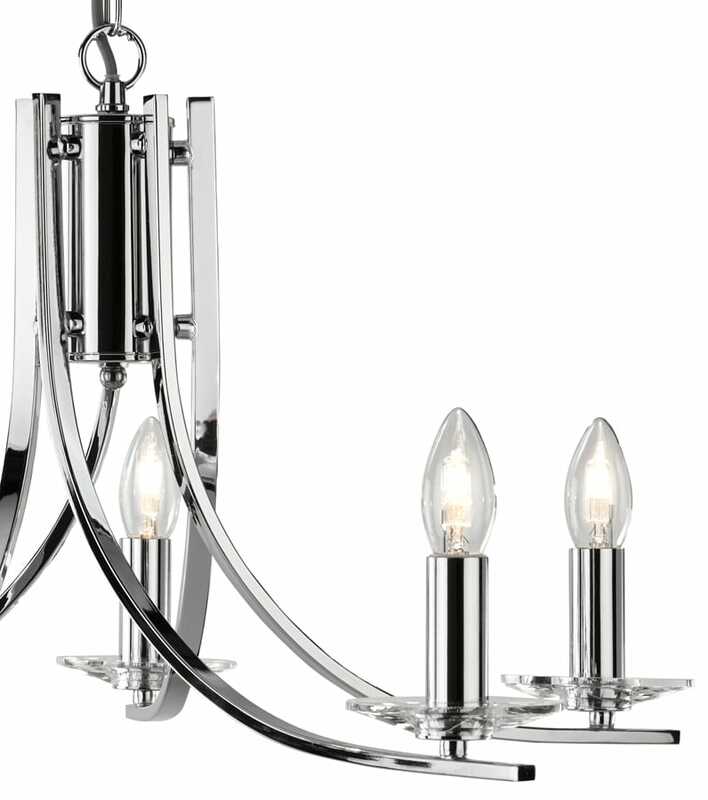 An intricate design featuring a blend of polished chrome and clear glass sconces, which adds depth and detail to the fitting. The Five delicate glass sconces twinkle whilst illuminating any room with style and sophistication. There are matching fittings available in the Ascona polished chrome lighting range that includes eight and twelve-light chandeliers and a matching switched wall light; please see below. Also available in antique brass or satin silver finishes, please enter the term Ascona in the search box at the top of this page to view the complete collection. This modern light is supplied by Searchlight who manufacture some of the best traditional and modern classic designs such as the Acsona modern polished chrome 5 light twist chandelier with glass sconces you see here. 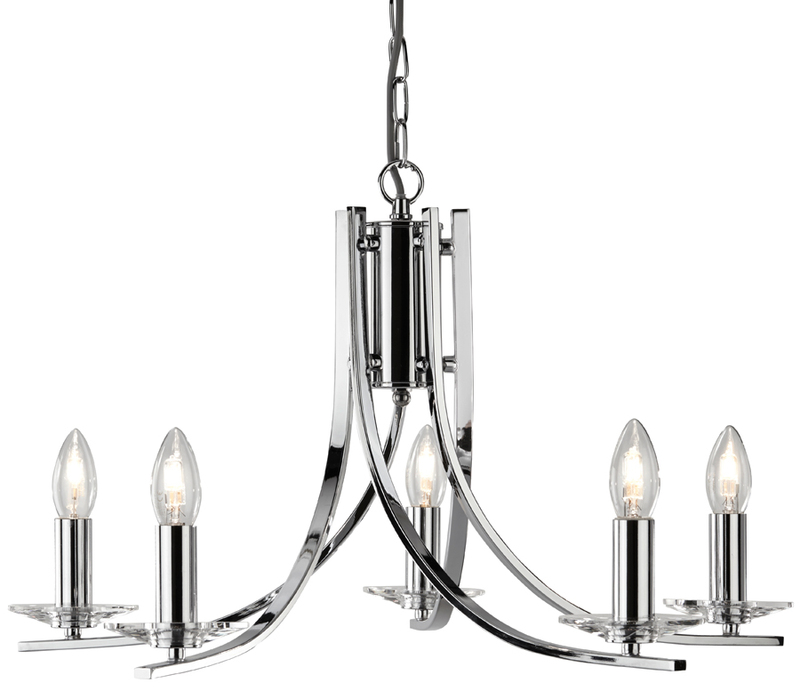 Ascona 5 Light Twist Chandelier. Is it possible to use shades over the bulbs? Thank you. Any clip-on lamp shades may be used on the Ascona chandelier. They are relatively inexpensive and simply clip to any candle lamp. A good selection of suitable shades can be found by following the link to our wall lights and chandelier shades section.